Top seed Grigor Dimitrov beat defending champion Lukas Rosol to win the third ATP title of his career at the Nastase Tiriac Trophy in Bucharest. The Bulgarian, 22, won 7-6 (7-2) 6-1 Sunday in one hour and 21 minutes to end Czech Rosol's nine-match unbeaten run at the tournament. Dimitrov, ranked 16th in the world, also won ATP titles in Acapulco in February and Stockholm last year. "I have worked really hard to start winning titles," said Dimitrov. "I have put in enough effort, time and sacrifices to get here." 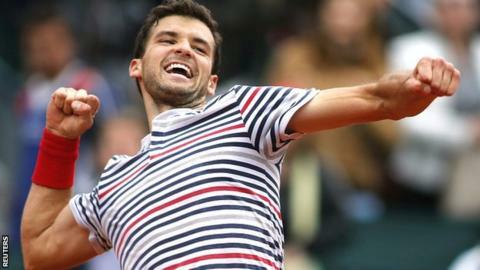 Dimitrov did not drop a set in four matches in Bucharest and will rise to a career-high ranking of 13 on Monday. Japan's Kei Nishikori beat Santiago Giraldo 6-2 6-2 to win his first clay-court title at the Barcelona Open, and become the first non-Spanish winner at the Real Club de Tenis since 1996. Eight-time champion to Nicolas Almagro on Friday.